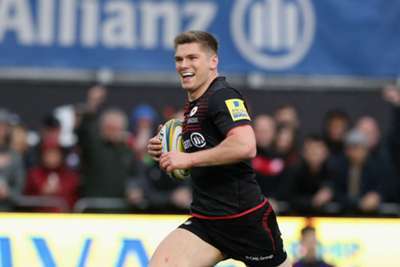 Saracens clinched a place in the Premiership semi-finals and all but ended Bath's chances of qualifying for the European Champions Cup with a resounding 41-6 victory at Allianz Park. Sarries ran in six tries in a comfortable triumph over Todd Blackadder's men, who suffered a fourth straight league loss for the first time since the 2011-12 season to leave a top-six finish looking out of their reach, with a 10-point deficit to Gloucester in sixth. Schalk Brits and Liam Williams crossed for the hosts, the latter from 80 metres, before Bath saw England international Jonathan Joseph have to leave the field on crutches due to a foot injury. Rhys Priestland kicked two penalties to keep Bath in the contest, but Richard Wigglesworth, Owen Farrell, Schalk Burger and Ben Spencer all went over to secure the bonus point in a one-sided second half. Sam Simmonds scored a hat-trick as Exeter Chiefs guaranteed themselves a home semi-final by beating bottom side London Irish 45-5 at the Madejski Stadium. England number eight Simmonds surged home from 30 metres for his first and completed the trio by dotting down from a wonderful Henry Slade pass. In the only response to the defending champions' six tries, Joe Cokanasiga powered in at the corner for London Irish, who are on the brink of relegation with the gap to 11th-place Worcester Warriors standing at nine points with two matches remaining.